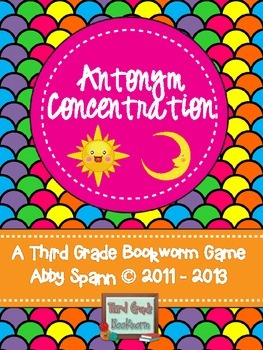 This is an antonym (memory) concentration game for 2nd - 4th graders. There are 30 word cards in two different sets. The first set is geared more towards 3rd and 4th grade readers. Struggling readers and ELL students will be able to practice the same skill with the second set. 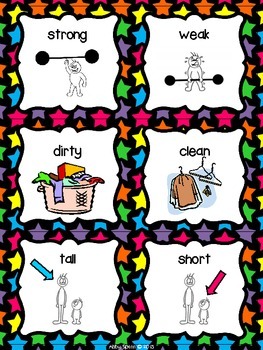 All students will benefit from graphics that support the text on each card. Ideas for whole group instruction, small group or partner play are included. 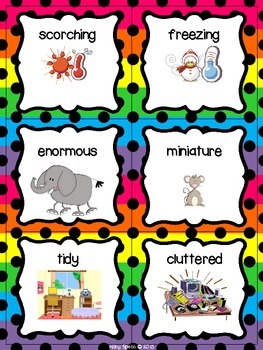 Two recording sheets were also created for students to use during small group or partner work time. The cards have been outlined with a dashed line to make it easier for you to laminate and cut! ELA-Literacy.L.2.5 Demonstrate understanding of word relationships and nuances in word meanings. ELA-Literacy.L.3.6 Acquire and use accurately grade-appropriate conversational, general academic, and domain-specific words and phrases. ELA-Literacy.L.5.5 Demonstrate understanding of figurative language, word relationships, and nuances in word meanings.